I write this on the last night of Barack Obama’s presidency. As we sit on the cusp of a new and entirely chilling era, I’ve felt a sick feeling of dread all day as I roamed the aisles of the NAMM. But one booth was amazing. Something I had never seen before, and so appropriate for this show. You see, 2016 was appalling beyond measure for a number of reasons. Not the least of which was the unbelievable number of incredible musicians that left us. This number, for some reason, was disproportionally represented by so many of the legends of electronic music. And so Moog Music created an unbelievable piece of art. They had no synthesizers on the show floor. Nothing to sell. 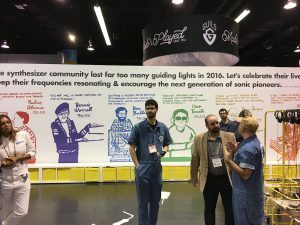 They had a giant wall with drawings of Pauline Oliveros, Don Buchla, Jean Jacques Perry, Isao Tomita, Bernie Worrell, and Keith Emerson – all electronic music legends, and all who died in 2016. They then handed out little personal music players, that you listened to while walking a maze of remembrance, peppered with quotes from and about these amazing artists. You then used Twitter or Instagram to send a fond thought or picture, celebrating these artists. Your reward was a small notebook to remember them by, or perhaps a Moog synth, or VIP tickets to Moogfest. I celebrated the life of Pauline Oliveros, who had been my teacher. But I remembered seeing Don Buchla so many times around the halls of Mills College, and working with Keith Emerson once on a multimedia project. How many people’s lives had been touched by these great artists? I stand, with the rest of my country and the world, on the precipice of despair. I am looking down the abyss into a cauldron of misery, corruption, and deception. I will pay no attention to the proceedings in Washington tomorrow, where a great man will leave and a despicable one will take his place. But while I’m busy not thinking about our future, I take comfort in our past. Thanks Keith, Pauline, and Don. Thanks for contributing beauty to the world, and for helping to make me who I am.